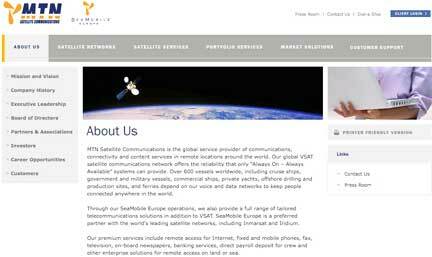 [SatNews] MTN Satellite Communications (MTN) has announced StreamXcel Plus, a new integrated hardware and software solution for managing shipboard satellite communications. StreamXcel Plus is designed to provide a suite of tools permitting vessel owners to optimize their ship’s satellite voice and data traffic while minimizing costs. Vessels operating on MTN’s extensive Ku-band satellite coverage have global, seamless connectivity, and access to guaranteed uncontended bandwidth. With StreamXcel Plus, vessels are provided with automatic switching capabilities to Inmarsat FleetBroadband (FBB) whenever the vessel moves outside the Ku-band beams for “Always On – Always Available” communications. StreamXcel Plus provides vessels with two separate onboard corporate and crew morale communication networks. The corporate network includes two voice lines, data and Internet access over VSAT with FBB as a backup communications system. StreamXcel Plus also provides VSAT bandwidth data compression and optimization allowing applications and networks to run optimally for time and cost savings. The crew morale communications network offers two voice lines using MTN’s OceanPhone® stored value calling plans and WiFi Internet access. MTN’s crew calling and Internet billing platform offer crewmembers several ways to purchase calling and Internet services. With StreamXcel Plus, the bandwidth required to support the crew morale communications network comes at no additional cost and does not interfere with the corporate bandwidth. StreamXcel Plus incorporates a wide range of tools to help the shipping company manage its ship-to-shore voice and data links, data compression, remote administration of servers and computers on board, and anti-virus, anti-spam and content filtering. MTN’s optional bandwidth analyzer software also provides detailed VSAT traffic analysis for the ship operator. MTN will showcase its full range of marine satellite communication products and services in Hall B6 Stand 488 at the SMM Hamburg 2010 exhibition in Germany, Sept. 7-10, 2010.